Eight classic bass guitars were sampled for the ReFill. 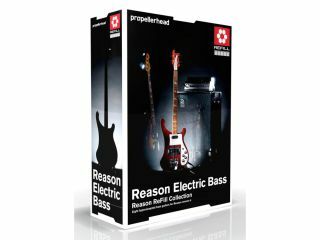 Propellerhead has unveiled Reason Electric Bass, the latest in its range of ‘Hypersampled´ ReFills for the hugely popular Reason software studio. As with many of The Prop´s other ReFills, this one comprises a range of patches for Reason´s Combinator device. These are built around samples from eight classic electric bass guitars: Fender Jazz Bass, Fender Precision Bass (flatwound), Gibson Les Paul, Rickenbacker 4001, Gibson EB-0, Kay Hollowbody, MusicMan Stingray Fretless and Fender Precision Bass (roundwound). The patches also contain a number of performance embellishments that you can throw in to make your bass parts sound even more realistic. These include release samples, hammer-ons and glissandos. Interchangeable 16-bit and 24-bit versions of the ReFill are supplied, with the former being suitable for use during the composing stage and the latter for final mixing. Compatible with Mac and PC, the Reason Electric Bass ReFill will be available on May 28 priced at $129/€120. You can find out more on the Propellerhead website.